O-M-G!! I totally totally hate this product. I am sorry on such a negative opener but I truly hate this product. It doens't even deserve a memory space in my camera that i had to get a photo online! I am a huge fan of Neutrogena skin care products. To me they are one of the best out there and affordable. I live by the Neutrogena 2in1 facial/mask cleanser and the deep clean facial cleanser. This product came out and I thought "ohh grapefruit". Every time I pass by the store I contemplate on getting it. Finally, my cleanser run out so I thought it's time to get this one and try it out. FIRST Day - it was lovely on the skin. Smells great and it leaves your skin baby soft. I was impressed. SECOND Day - i started feeling some dryness that my "fine" lines were soo stretched out because my skin was so dry. I didn't mind it that much because my moisturiser is very rich. THIRD Day - OMG! it burns!!!!!!!! it burns like no one's business. I've stopped using it (2 days now) and my face still burns. I've put my face creams in the fridge so it's cooler when i apply it on my face. I can't see any red patches but my cheeks are normally smooth but now you can see bumps and did say it burns!!! it really does and I really hate it. I hope burning sensation goes away soon and my cheeks' skin texture will return to normal. 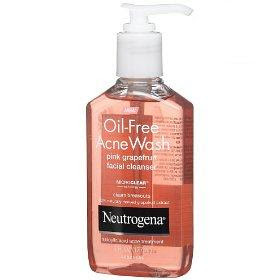 I think this product is only meant for VERY OILY skin but either way, please please be cautious when using this. I dont personally recommend this one as it is really bad and harsh on the skin. But if this works for you then I am happy! But never again. I am throwing it out I am afraid. There are no good reviews out there on this product. I am quite surprised that I didn't search for a review.. i just had my full trust on the brand.. BOOO!!! I am so glad you wrote this review. I've been intending to buy this cleanser for a while, but now I won't bother. OMG - it's really horrible! i think it's really meant for very very oily skin. no, if you have only occassional pimples like i do, please stay out of this.